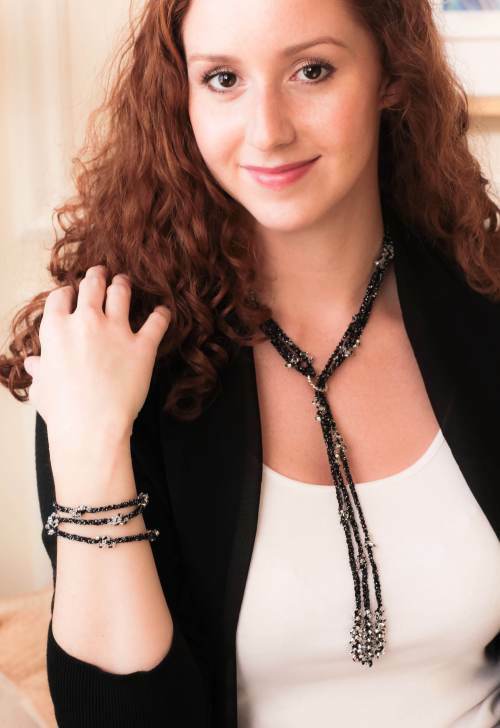 Lariat necklaces are a great way to make a unique jewelry statement. The Arya Crochet Lariat Necklace is crocheting with beads at its easiest. It can easily be crocheted to any length for the perfect fit. Three strands of crocheted shimmering yarn adorned with clusters of sparkling glass beads pass through a stylish metal ring, leading to three clustered bead pendants. The fluid design moves throughout the day, taking on different shapes adding to the necklace’s allure. Wear it alone or pair it with the matching Arya Crochet Bracelet. Video tutorial is available on Javoridesigns.com.